Mumbai, a culinary cornucopia of contrasting flavours, is one of the most revered destinations for a mouth-watering gastronomic indulgence. The kaleidoscope of aromas, spices and tastes of the street food that turn the pavements of the city into a vast open-air buffet, is an assault to the senses. The street side mobile food kiosks of Mumbai are so outrageously popular that the locals always find time to pause at these rickety carts in the narrow by-lanes for a street-food haul. A necessity's child, the city's legendary street food has its origins in its now dilapidated mills and factories, where throngs of workers needed quick, savoury and inexpensive meals on the go. The streets of Mumbai still surge into life every morning like a rhythmical orchestra as a squadron of mobile chefs engage in a daily ritual of chopping, spicing, grilling and frying; dishing out cheap and delectable eats every day. Given to the gospel that Mumbai's cuisine has been carved and shaped by centuries of seasoning at the hands of Koli fishermen, Hindu dynasties, Muslim sultans, the Portuguese and British colonists, the city's giddy street food scene must be a reason alone to visit Mumbai all by itself. As you hunt down the street stalls, seek out the delicacies of this dizzying dazzling metropolis, here are our top picks for your street-eat crawl in Mumbai. If you have not tried vada pav on your trip to Mumbai, have you even been to Mumbai? 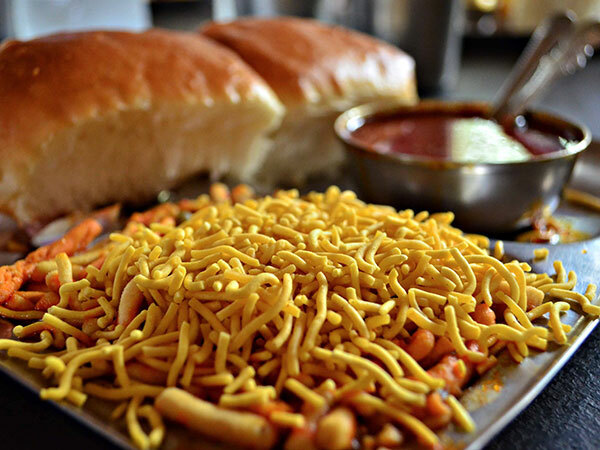 This flagship dish of the city makes for a ubiquitous snack to munch on. Popularly known as the 'poor man's burger', a vada pav is essentially a bun bread(pav) and a fritter(vada) stuffed with mashed potato. Served with tangy and sweet chutneys(sauces), fried chillies, and garlic powder chutney, vada pav today stands symbolic of the Marathi pride. This classic Mumbai street food is a spicy-tart snack that translates to 'super hot chickpeas'. A concoction of fried pulses, onions, chutney and spicy masalas, chana jor garam is one tangy treat and is freshly prepared for each serving. This compact and savoury palate teaser comes in sporadic variations to take your pick from. Mumbai's favourite fritters - delicious packages of onion, potato, spinach, aubergine, green chillies, mixed with flavoursome spices, deep-fried in butter and served with butter-soaked pav(bun), pav bhaji is a popular choice of street snack in the city. The origin of this snack has an interesting story to it. Its history has been traced back to the 1840s. It was originally a late night food that was made for workers from leftovers of curried vegetables and mashed potatoes. Mopped up with butter and spice, Mumbai's pav bhaji tastes so inexplicably delicious, that you can barely resist a bite of it. Sugar rushes are induced on every nook and cranny of the lanes of Mumbai. Try out the delectable falooda, a people's favourite, to satiate your sweet tooth in the Mumbai street food crawl. An adaptation of the Persian dessert, a falooda is nothing but a rich tall glass of vermicelli noodles served with ice-cream and dried fruits and nuts, doused with rose syrup and topped with sweet basil seeds. Tickle your taste buds with this flavourful preparation of a sweet summer delicacy and make sure to savour some on your next trip to the city. Inclined to Mumbai's privileged location nestled on the Arabian Sea, the city has an intimate relationship with seafood. The Bombay Duck Fry is nothing but lizard fish fry that steals the show and takes the centre stage as a unique coastal delicacy of the city. The seven islands that shape Mumbai, being home to myriad fishing colonies, boast of this piquant delight, which is locally known as 'bombil' in Marathi. Integral to the city's cuisine, the Bombay Duck Fry is prepared in a traditional way and your trip to Mumbai would be incomplete without trying out this indigenous tantalizing delicacy.